What's on the economic agenda for Thursday? Notable events include Norway's central bank making an interest rate decision. In Brussels, the European Council will be meeting for the first time since the U.K. election. In France, the new French government holds its first cabinet meeting since the legislative election. Meanwhile in the U.K., details of a deal between the ruling Conservative party and the Northern Irish DUP are expected to be released. Also, here's a timetable for the economic data releases through the day (all times are BST). 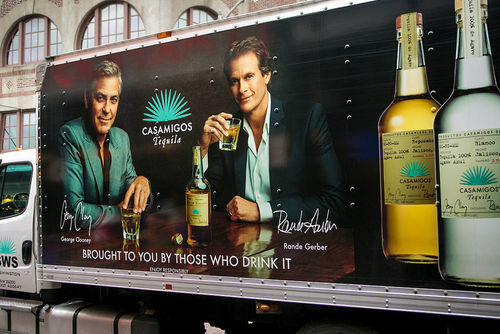 Diageo is buying George Clooney's tequila brand for up to a billion dollars. Clooney and some friends founded the upscale brand Casamigos in 2013. Diageo is paying $700 million up front. Bigger payments could follow if performance targets are met. High-end tequila is doing well at the moment. Diageo sees potential for growth for Casamigo in Europe. 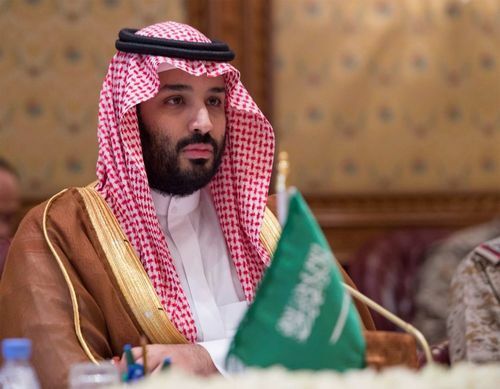 President Trump has offered his congratulations to Saudi Arabia's new crown prince Mohammed bin Salman (pictured). This after his father, King Salman, appointed him successor, ousting his nephew Mohammed bin Nayef. In a phone call, the two discussed the ongoing diplomatic crisis with Qatar, as well as regional security and economic issues. The crown prince visited Washington in March. 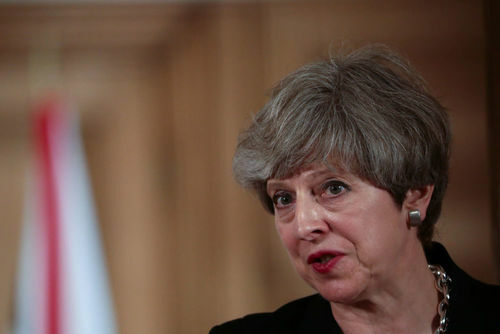 British Prime Minister Theresa May is considering cutting corporate taxes in a bid to make U.K. more attractive to business. She's in Brussels today for her first EU summit since her Conservative Party lost its parliamentary majority in the UK general election. May says she will be listening closely to business concerns about how Brexit will unfold. U.K. PM Theresa May is incompetent, ignorant and selfish. That's the view according to Beat Wittmann, partner at Porta Advisors. I think for the next few months it will be very, very difficult for the U.K., not because of Brussels, or whether there’s a cordial interaction or not, I just think the EU understands better the dynamism, or the lack of dynamism, in U.K. domestic politics, and U.K. politicians have not a minimal understanding of the EU, it seems to me. I think we will see a new prime minister within the next 3 to 6 months and the most likely one is Boris Johnson. 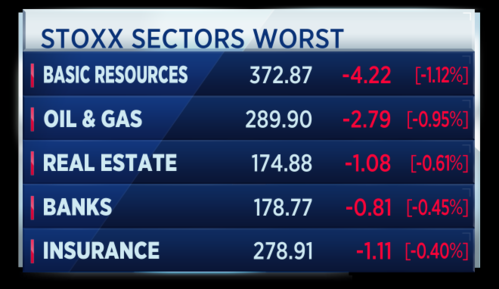 The falling oil price weighed on U.S. markets yesterday, hitting energy stocks hard. 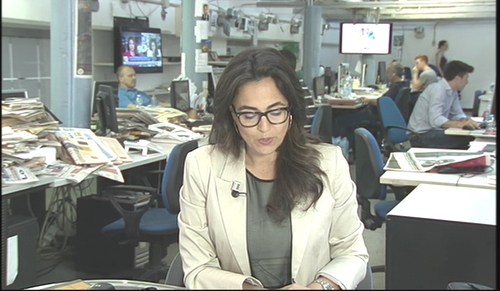 The Dow and S&P finished negative, while the Nasdap recorded a gain. 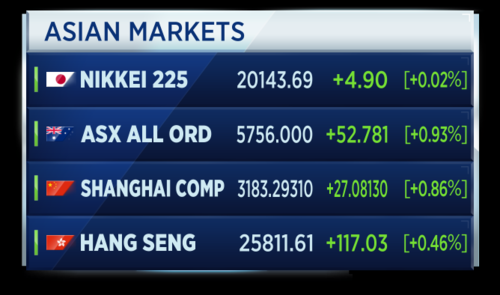 Asian stocks fared better, as oil stocks tried to drag themselves up from 10-month lows. Chinese shares saw significant gains after MSCI's decision to include them in its emerging market indexes. Senate Republicans want to roll back expansion of America's health care benefits for the poor. That's among the details starting to dribble out about the health care overhaul that U.S. senators are expected to roll out later today. The Washington Post reports the bill will repeal most of the taxes used to pay for Obamacare and cancel funding for Planned Parenthood. A vote on the bill could come as soon as next week. 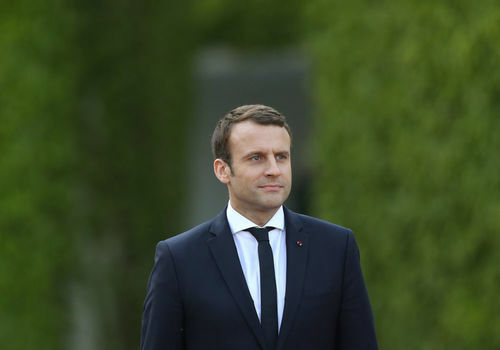 French President Emmanuel Macron is getting down to business with a crew that includes many political newcomers. The re-shuffled cabinet meets today for the first time since the legislative election where Macron's party and his allies won a commanding majority. Several ministers resigned recently, but Macron swiftly replaced them. That was U.K. finance minister Philip Hammond's response when asked if he thinks Theresa May will still be the country's prime minister by the end of the year. 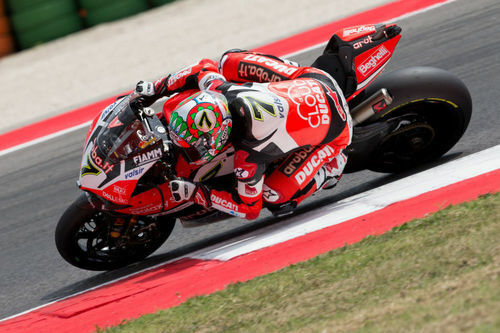 Harley-Davidson is considering a bid for Italian rival Ducati in a deal that could be valued up to 1.5 billion euros. This according to Reuters. Volkswagen, whose Audi division controls the Italian motorcycle maker, has also drawn interest from Indian firm Bajaj Auto. Several buyout funds are reportedly also eyeing one of the most famous names in the industry. Meanwhile, Altice USA, part of the Franco-Dutch cable giant, has raised $1.9 billion in its IPO. Priced at $30 a share, the company's market cap is approximately $22 billion. The listing is the second largest U.S. IPO this year. Altice USA will trade later today under the ticker symbol A-T-U-S.
Britain's finance minister Philip Hammond says British people want a Brexit that protects their jobs and standard of living. He says business investment is being postponed until the outcome of Brexit is clear and adds that he is not at odds with governmental colleagues over the type of Brexit the U.K. should seek, according to Reuters reports. 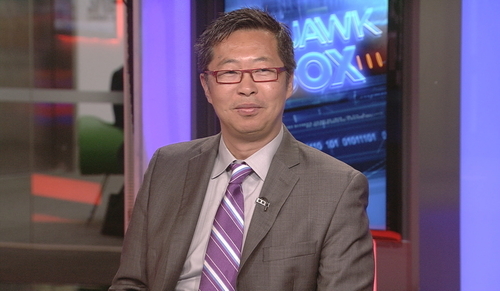 Steven Oh, global head of credit and fixed income at PineBridge Investments, explains why his firm decided not to buy the 100-year bonds being issued by Argentina. First of all, buying anything 100 years I’m not so sure is necessarily a good idea, but it takes I think some type of either tremendous short term trading knowledge or betting or some type of great insights about the future of Argentina and we try to buy things which we have a little bit better handle on, and that’s not it. 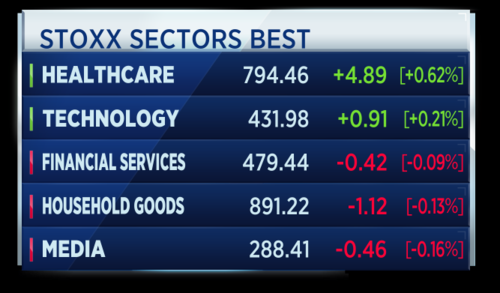 Tech and health care are the only European sectors in the green. 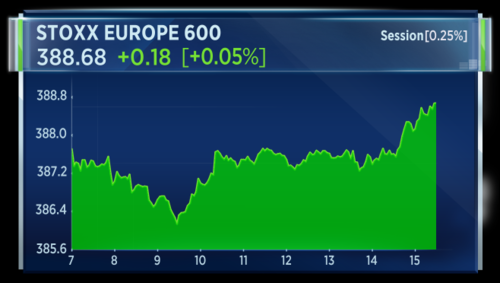 Basic resources and oil & gas are dragging on the Stoxx 600. Future values predicted the German DAX would open higher at the start of Thursday trade. 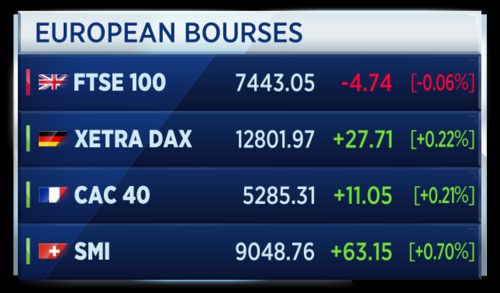 Instead, the index has followed the FTSE and CAC lower, down about two-tenths. 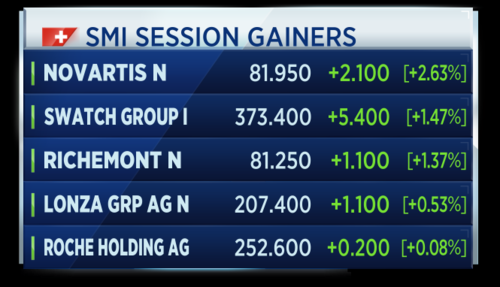 Swiss stocks are performing well this morning after data this morning showed the country's trade surplus for May increased to 3.4 billion Swiss francs. The countdown is on to the start of NAFTA renegotiations. Agriculture ministers from the U.S., Mexico and Canada met this week to lay the groundwork for upcoming talks. President Trump made a revised North American Free Trade Agreement a key theme of his campaign. 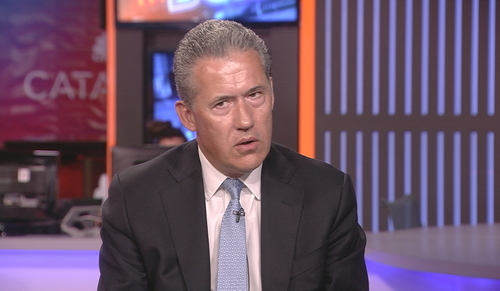 Francisco Gonzalez, director general of Bancomext, Mexico's export - import development bank, says the U.S. needs Mexico. If you buy something that says made in Mexico, you’ll find 40 percent of U.S. items and ingredients in that product, but if you buy something made in Canada, only 20 percent. If you buy something made in China, only 6 percent made in the U.S. is in that product. So this relationship is very important. These are some of the stocks moving markets today. The British competition watchdog has given the green light to Standard Life's £11 billion deal to acquire Aberdeen Asset Management. The merger is going to create the UK's largest listed asset manager. Harley-Davidson is considering a bid for Italian rival Ducati in a deal that could be valued at up to 1 and a half billion euros, according to Reuters. Volkswagen, whose Audi division controls the Italian motorcycle maker, has also drawn interest from Indian firm Bajaj Auto. Several buyout funds are also reportedly eyeing one of the most famous names in the industry. 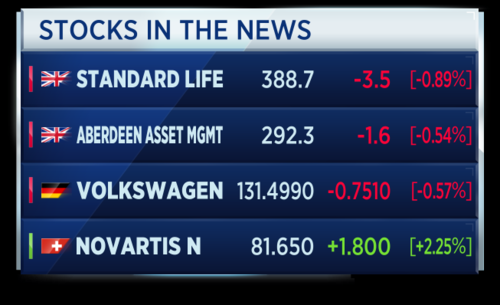 Shares in Novartis are trading higher after a study found that the drugmaker's new investigational medicine reduced cardiovascular risks for people who had survived heart attacks. Italy's tax police have raided the offices of 5 banks. It's part of an investigation into diamond sales to clients. This according to Reuters. Unicredit and Intesa Sanpaolo are said to be among those involved. The question here is how this was exactly carried out. This was illegal in Italy to make a financial return unless the diamond sector was regulated in some way like the other financial products so if that's the case then these banks may have been allegedly been putting their clients into contact with the diamond salesman with these businesses could create a problem. Brent crude dips below $45 a barrel for the first time this year, dragging on European energy stocks. Novartis shares get a shot in the arm after a study finds its new drug reduces cardiovascular risks for people with heart conditions. Calling on investors. 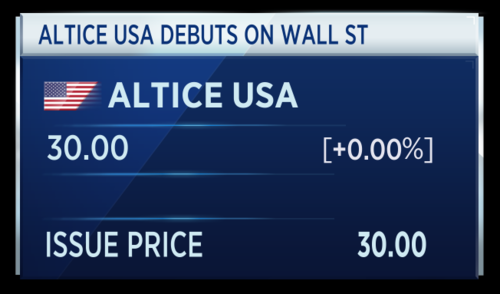 Cable operator Altice raises almost $2 billion in its U.S. IPO, making it the second largest American offering of the year. On the road to bankruptcy. Takata shares lose half their value as the airbag maker reportedly seeks protection from billions of dollars in liabilities. President Trump has called new Saudi crown prince Mohammed bin Salman to offer his congratulations. The two men talked security and economics on the phone yesterday. UK Prime Minister Theresa May has also welcomed the appointment. Prince Mohammed is now first in line to succeed his father, King Salman. He replaces the King's nephew, Mohammed bin Nayef. Prince Mohammed also becomes deputy prime minister, while retaining many of his previous powers. He'll oversee much of Saudi Arabia's energy strategy, which includes the highly-anticipated Saudi Aramco IPO. The crown prince is hoping his so-called vision 2030 will help Saudi Arabia become less reliant on oil exports. This is pretty significant for a number of reasons. I think the first reason is that this is really the first test for Saudi Arabia to see how it can manage the inevitable shift from the sons to his grandsons and there has always been a bit of concern that transition could cause a bit of instability. Airbus says it won commitments for 326 aircrafts and 144 firm orders at Paris Air Show, Boeing got 443 net orders and commitments so far. That's according to Reuters. EU leaders are gathering in Brussels today for a summit to discuss Brexit and security. U.K. Prime Minister Theresa May is due to attend the summit. Mrs May is expected to address the other 27 EU leaders and outline her plan for Brexit, including securing early guarantees for EU nationals living in Britain and British nationals living in the EU. ECB's Hakkarainen says I would therefore like to see, over time, an increase in the number of cross-border bank mergers in Europe. He says banks should not and must not wait for the public sector to provide an overarching solution to NPL problem. That's according to Reuters. S&P Global says breakdown in Brexit talks would be negative for UK credit rating, but downgrade of more than one notch would be unusual. S&P Global also says breakdown in UK Brexit talks is "absorbable" for European Union Ratings at current levels. That's according to Reuters. The U.K. cannot hope to retain its financial passporting privileges if it pursues a so-called "hard Brexit" that involves a withdrawal from the European Union's single market, according to Valdis Dombrovskis, the vice president of the European Commission. The issue is quite clear. EU passports are linked to the EU single market. So if the intention of the U.K. is also to leave the single market then indeed U.K. financial institutions cannot have EU passports, declared Dombrovskis, who is also the European commissioner for the euro and social dialogue, speaking from Brussels to CNBC on Thursday. CNBCThe U.K. cannot hope to retain its financial passporting benefits if it pursues a hard Brexit, says European Commission vice president Valdis Dombrovskis. 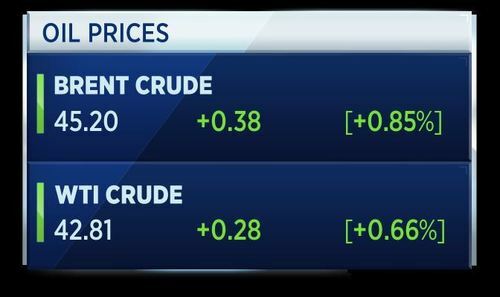 Oil prices rose on Thursday for the first time in three days after U.S. crude and gasoline stockpiles fell, but investors are looking for more signs that output cuts by OPEC and some other producers are ending a three-year glut. CNBCOil prices rose on Thursday for the first time in three days after U.S. crude and gasoline stockpiles fell. President Donald Trump has floated the idea of building a "solar wall" on the U.S.-Mexico border. In a speech to a rally in Cedar Rapids, Iowa, on Wednesday, Trump reaffirmed that the proposed wall would be built and then teased the idea that it could contain solar panels. You know, people don't realize we're already spending a lot of money on design, but I'll give you an idea that nobody has heard about yet. 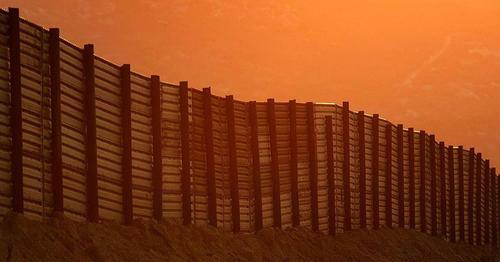 CNBCPresident Donald Trump has raised the idea of building a "solar wall" on the border between the U.S. and Mexico. 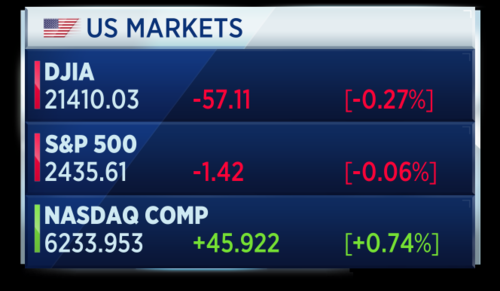 U.S. markets could be set for a positive open today but will remain under pressure as the oil price continues to weigh. West Texas crude is up in session but has fallen more than 4 percent over the last seven days. On the data front, jobless claims are due out at 8:30 a.m. ET, followed by the FHFA House Price Index at 9 a.m. ET and the Kansas City Fed Manufacturing Index, expected at 11 a.m. ET. Elsewhere, the Federal Reserve board is set to release the results from the latest supervisory stress tests conducted as part of the Dodd-Frank Act. 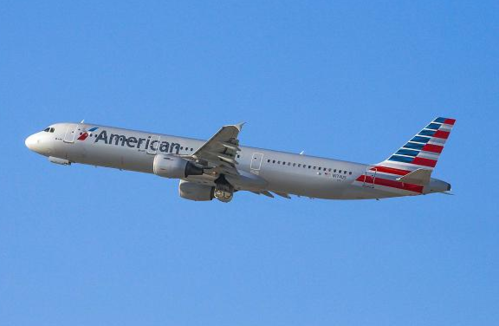 Qatar Airways intends to buy 10 percent of American Airlines. This according to a filing to market from the U.S. airline which said Qatar plans to buy at least $808 million worth of American Airline's common stock. The proposed investment by Qatar Airways was not solicited by American Airlines and would in no way change the company's Board composition, governance, management or strategic direction. 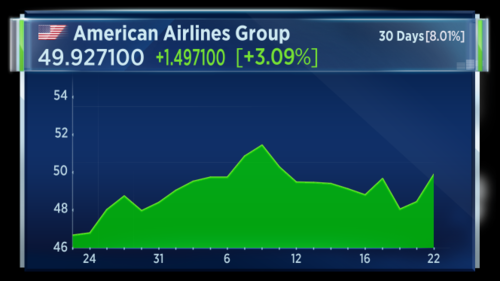 In pre-market trade, American Airline stock has risen more than 5 percent. American Airlines Airbus A321 taking off from LAX. 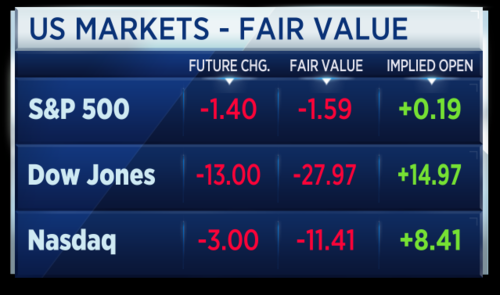 U.S. markets are expected to open marginally higher, according to future values. Investors are cautious as they anticipate a set of economic data releases. 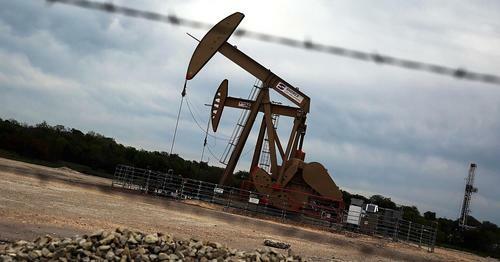 Volatile oil prices will also be weighing on their decisions. German chancellor Angela Merkel has told reports she wants Brexit talks to be held in good spirits. That's according to Reuters. Tim Edwards, Senior Director, Index Investment Strategy at S&P Dow Jones Indices has put out a fresh note on the current lack of volatility in the market. 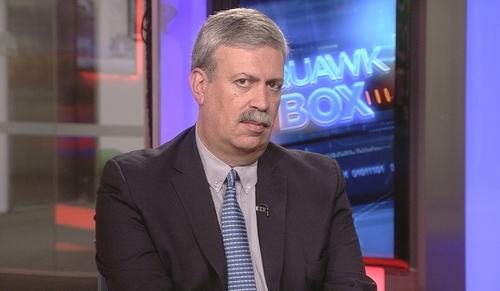 Edwards says the market is "intensely relaxed". • Be it through complacency or prescience, the market is intensely relaxed at present. Most of our volatility measures are down, and several to unusually low levels. • VIX not risen above 12 for over a month, closing last night at 10.75. Although not quite an all-time-low, VIX recorded its lowest closing value in 23 years when it ended June 2nd at 9.75. • The sustained low volatility environment has provided a boon to volatility sellers; the S&P Daily Inverse Short Term VIX Futures index has tripled over the past twelve months. In signs that such outsized returns may be attracting more participants, the VIX futures curve is unusually shallow. Only 5% separates the price of the front future from that of the front-next. • Exceptions to the rule were provided by the British pound, which continues to reflect the political uncertainty generated by the start of the “Brexit" negotiations and the failure of any party to secure a Parliamentary majority in the recent election, and Australian equities - the latter rattled by signs of a downward turn in the property market. 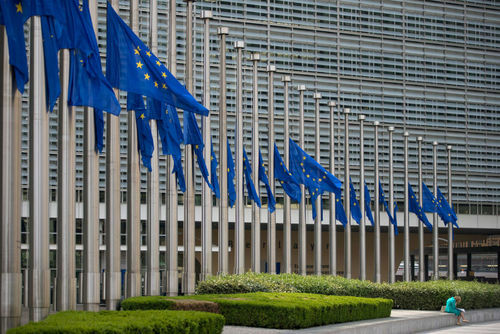 EU heads of state or government meet today and tomorrow in Brussels. How to combat radicalisation and a strengthening of EU cooperation on external security and defence are the main topics. The European Council says it is also reaffirming its commitment to the Paris Agreement on climate. 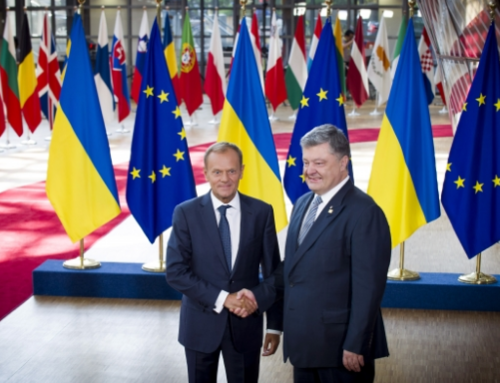 Donald Tusk, President of the European Council with Petro Poroshenko, President of Ukraine. 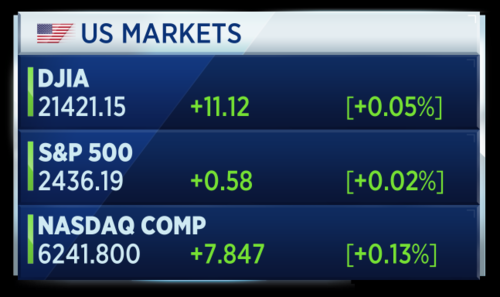 Shares in American Airlines are more than 3 percent higher as we digest news that Qatar Airways wants to buy as much as ten percent of the company. The best and the worst of the main U.S. indices below. 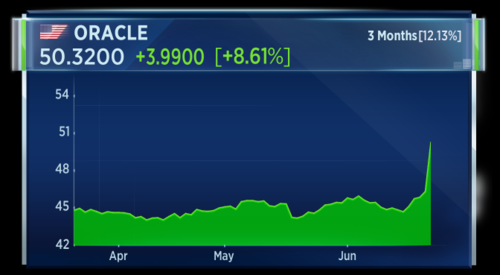 Oracle stock is up over 8 percent and just around pace for its best day since Dec 18th, 2014. The firm has almost surpassed its 30-day average volume of 11.4 million shares, already trading over 11 million within 10 minutes of Thursday trade. The business software maker has reported adjusted quarterly profit of 89 cents per share, 11 cents above estimates. Revenue was also above forecasts, with increased customer enthusiasm for cloud-based products and service. Altice USA, the cable operator that Netherlands-based Altice formed by acquiring Cablevision and Suddenlink Communications, has raised $1.9 billion in an initial public offering. The issue price is $30. This morning trade has not started yet. 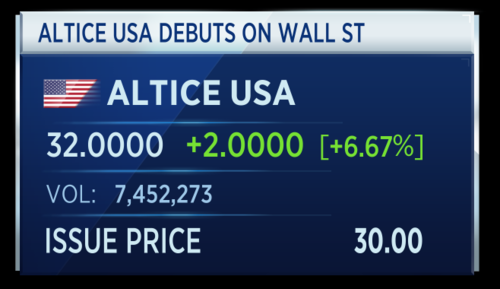 It is a near 7 percent rise for Altice USA as it makes its baby steps on Wall Street. A flat session for the average of stocks in Europe. It looks like this across the main bourses.